1. How do you respond to the argument of atheists? 2. What is the connection, if any, between science and religion? 3. What are the strengths and weakness of rational thinking? one level of awareness. How does this apply? of metaphors? Of spirituality? 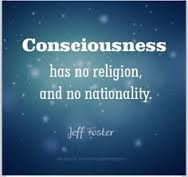 Of consciousness? It's always helpful to "see the world with new eyes" or, as the saying goes, "walk a mile in the other person's shoes." Colorado Springs has long been known as the Home of the Religious Right. At the same time, we read a number of news stories that more and more folks are identifying themselves as agnostics, atheists, or simply non-religious. It seems that science is eclipsing religion, ever so slowly. Even children have difficulty believing the wild and outlandish stories contained in the ancient holy books like the Bible, the Koran, or the Gita. How can they believe that the cosmos was created by a supernatural, anthropological God who swooped down from the sky, picked up some dirt, and magically made the first human? Then took a rib out of him and made the first woman? How can even children believe that a man lived for a while in the stomach of a large fish, then came out alive? Or that two of every living thing could fit into a ship of any size at all? Mark Twain, an atheist, thought it odd that Noah went back to pick up some disease-spreading mosquitoes and houseflies. Atheists take pride in claiming that what they believe is based on scientific evidence while religious dogma is based on myth. But the atheist's position that "I don't believe in God because science has not proven that God exists" is not a default position. The position that "I believe in God because science has not proven that God does not exist" is just as valid. The question then becomes: Which position carries the greatest risk if in the end proves wrong? Obviously, the atheist takes the greatest risk for the very God he has denied may hold him accountable. Larimore Nicholl declares that he does not need God to deal with life's challenges, i.e., "we never wait for divine intervention to solve our problems." This statement reflects the atheist's claim that belief in God is a crutch for the weak and ignorant. But atheism is also embraced as a crutch by those unable to live up to their own moral standards and afraid of being accountable to God.